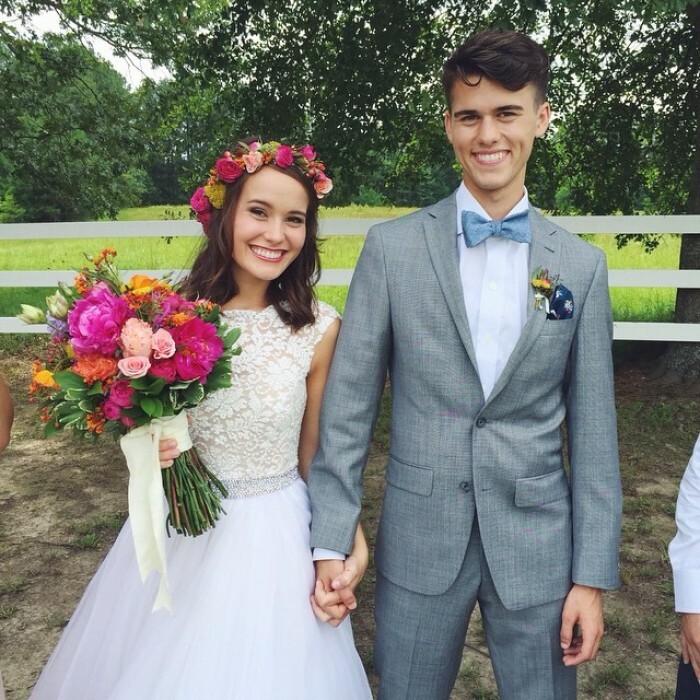 "Duck Dynasty" star John Luke Robertson married his fiancée, Mary Kate McEacharn, in a country style wedding on Saturday. "I had an amazing time!" Robertson told Us magazine in a statement, with his new bride, adding: "It was one of the best days of my life! It was everything I hoped it would be and more." The newlyweds, both 19, tied the knot before a group of 800 family members and friends in an outdoor ceremony at the Robertson family farm in West Monroe, Louisiana. His father, Willie Robertson, officiated the wedding and McEacharn thanked God after her big day while sharing an intimate photo on social networking site Instagram. "Well ... WE GOT MARRIED! Thank you to everyone for the love and support and thank you to God for the absolutely perfect weather. Love my new husband and love being Mrs. Mary Kate Robertson. Let the adventure begin," she wrote alongside a photo of her and her new husband. A local band played various hit songs during the fun-filled reception, including an acoustic version of The Beatles' "Here Comes the Sun" and "Amazing Grace." Guests were treated to a mouthwatering menu that included grilled chicken skewers with vegetables, barbecued shrimp, and brisket sliders. "[Mary Kate] wanted it real fun, real casual, and she wanted flowers to be a big central point of it all," said wedding planner Bethany Sigrest." The couple met and became friends at a Christian summer camp in 2010 before they began dating three years later in 2013. "I had tried to date her before, and she kept turning me down! I just kept at it and she finally said yes!" said Luke previously. "I just knew [she was the one]." Luke proposed to Kate during his 19th birthday celebration last year. At the time, he likened their bond to that of his reality star parents, Willie and Korie Robertson, who have been married more than two decades. "I am so excited to marry my best friend. I know my parents married young as well, and they have always been examples of what 'could be' to me," he said in a statement to E! News. "Fast-forward 22 years and they are more in love than ever, and I hope Mary Kate and I are the same way in the years to come. God has truly blessed us."